The MAX4165-MAX4169 family of Operational Amplifiers combines excellent DC accuracy with high output current drive, single-supply operation, and Rail-to-Rail inputs and outputs. These devices operate from a single +2.7V to +6.5V supply, or from dual 1.35V to 3.25V supplies. They typically draw 1.2mA supply current, and are guaranteed to deliver 80mA output current. 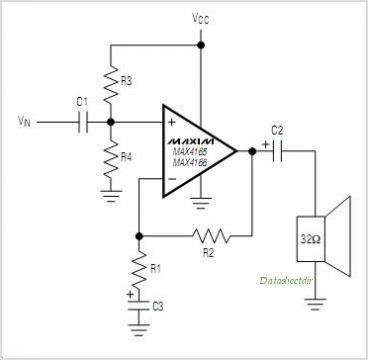 The MAX4166 MAX4168 have a shutdown mode that reduces supply current to 38A per Amplifier and places the outputs into a high-impedance state. The MAX4165-MAX4169's precision performance combined with high output current, wide input/output dynamic range, single-supply operation, and low power consumption makes them ideal for portable Audio applications and other low-voltage, battery-powered systems. The MAX4165 is available in the space-saving 5-pin SOT23 package and the MAX4166 is available in a tiny 2mm x 2mm x 0.8mm DFN package. This is one package pinout of MAX4165,If you need more pinouts please download MAX4165's pdf datasheet. 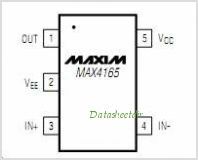 This is one application circuit of MAX4165,If you need more circuits,please download MAX4165's pdf datasheet.